DC Universe announced that DC Universe Movie titles will now appear on the streaming service day-and-date with the film’s physical media release starting 2019. The details came as part of a larger press release highlighting upcoming events for the Warner Media’s DC Comics-based digital outlet. 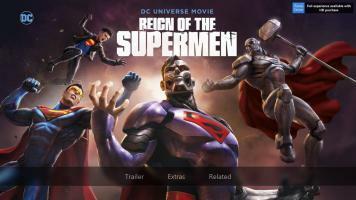 The next DC Universe Movie title, Reign of the Supermen, will be the first animated feature available the same day as its physical media release. Green Lantern: The Animated Series will also be joining the platform in January 2019. Continue below for the press release. New Trailer Teases Dark Heroes, Unlikely Villains, and ….a Battle with Batman? Just in Time for the Titans Season Finale: Nearly 50% off for a Limited Time! DC Universe released today the final trailer for the first season finale of acclaimed original series Titans. Fans have been speculating if and when a major DC fan-favorite would make an appearance in the first season and this trailer reveals that it all comes down to the ultimate face-off: Robin vs. Batman. Don’t miss the exciting finale airing on December 21. See the trailer here. To further brighten the holiday season, it was announced that new DC Universe animated movies will be available on DC Universe on the same day as each title’s 4K and Blu-Ray Combo pack release. New DC animated movies coming in 2019 include Reign of the Supermen, Justice League vs The Fatal Five and Batman: Hush. Reign of the Supermen will be available January 29, other dates will be announced closer to their availability. The Titans finale unlocks the ability to binge all episodes from season 1, and that’s just the beginning. A new DC Universe content line-up kicks off in December and January that will have fans reveling in the hope and redemption of their favorite DC Super Heroes. A subscription to DC Universe is the ideal way to break-in new devices gifted and received over the holiday season. Among the fan-favorites are additions Green Lantern: The Animated Series, one of the most requested series on the platform, available on January 1 and a binge-worthy selection of Batman content including the live-action features Batman (1989), Batman Returns, Batman Forever and Batman & Robin. To celebrate the Titans finale and the slate of new content, DC Universe is offering nearly 50% off membership for U.S. subscribers for a very limited time. The first three months of membership are available at $3.99/month for 3 months or subscribe for a full year for $59.99 plus taxes, where applicable from 12/13-12/20 at dcuniverse.com/join. It’s not too late to catch up on all the action before the final episode of Titans streams on December 21 or binge watch the full season after the final episode airs. And, if that’s not enough content to get you through the holidays, DC Universe will also share holiday cheer with its first-ever Holiday Yule Log, set for release the week of December 17, and available through the holidays. You’ll need to pay attention because Santa won’t be the only one dropping by – keep an eye out for season’s greetings from some of DC’s most famous Super Heroes and Super-Villains. DC Daily, the news show that covers all things DC, will celebrate the season by showcasing some iconic characters and costumes from Mr. Freeze and the emperor penguins to the Catwoman and Batman suits from The Dark Knight Rises, plus many more. Watch for holiday themed sets, surprises and rare treasures never before seen outside the film productions they starred in. Plus a surprise from the Warner Bros. Archives to be unveiled on December 21. From December 14 – 24 DC Universe members have a chance to participate in 10 days of gifts directly from their favorite characters. Ten lucky winners will have the chance to win one of 10 unique mystery prizes, to be revealed each day, featuring DC Super Heroes and Super-Villains such as Batman, The Joker, Swamp Thing, Wonder Woman, The Flash, and more. After just three months since its debut, DC Universe’s first original series, Titans, has been viewed by 97% of members. While video content is popular, members are also engaging almost equally with comic books with 2.7 million comics read to date. Time spent across community forums, daily news and the character encyclopedia demonstrate that the service provides a meaningful platform for many kinds of fan engagement. 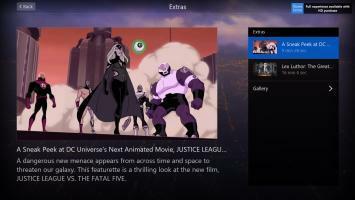 “This early glimpse at how our members are engaging with DC Universe points to why fans joining the digital service are not just video viewers; they are reading comics, participating in the community, and winning rewards on a service that allows them to not only stream exciting series and movies but share their fandom in a place that is all their own,” said Sam Ades, senior vice president and general manager, DC Digital Services. –Young Justice Seasons 1 and 2 top the charts as among the most-viewed content on the digital subscription service. -97% of members have watched the exclusive original Titans. –Batman: The Animated Series (HD) and Teen Titans are also among the most popular series currently available from the DC library. -208 DC Super Heroes and Super-Villains appear across the 93 episodes of Super Friends – all nine seasons are available exclusively on DC Universe. -Over 2.7 million comic books have been read to-date – the most popular is The New Teen Titans #1. -DC Universe members are reading comics that relate directly to the video content they are viewing with Nightwing, Teen Titans, Young Justice and Robin: Year One among the top 10 titles. -Over 50,000 users voted in the re-creation of the famous “Should Robin live or die?” poll. And this time, fans decided he should live! -6,000+ discussions on Batman theories, favorites, powers and portrayals are currently happening in the DC Universe Community. -DC Daily is among the most-watched programs on a daily basis. -DC Daily has released a new episode every weekday since launch, with 64 episodes to-date and counting; guests have included Kevin Smith, Minka Kelly, Brian Michael Bendis, Caity Lotz, Jesse Rath and Paul Dini to name a few. -The DC Universe Encyclopedia has over 250 entries, including multiple entries that cover Aquaman’s pets: Topo, an Atlantean octopus, Tusky, an unnaturally intelligent walrus, and Storm, Aquaman’s loyal giant seahorse. Since going live, DC Universe has run weekly sweepstakes giving away amazing rewards to members including: a tour of DC, a ride in the Batmobile, a trip to the Aquaman movie premiere, tickets to screenings across the country and hundreds of books, posters, toys and more. Launched on Batman Day, September 15, 2018, DC Universe is available today at $7.99 per month or $74.99 annually (plus taxes, where applicable). DC Universe is available in the U.S. on iOS, Android, Apple TV, Android TV and the Roku platform, as well as the web and mobile web, with more platforms coming soon. To learn more and purchase today, visit dcuniverse.com and follow DC Universe on social networks including Facebook, Instagram and Twitter. DC Universe is a first-of-its-kind digital subscription service giving fans access to exclusive content and experiences not available anywhere else. Showcasing DC’s iconic characters, DC Universe offers new original live-action and animated series, legendary films and series, and epic animated movies, as well as a fan community, digital comic books, and exclusive merchandise. DC Universe is operated by Warner Bros. Digital Networks in collaboration with DC. DC Universe offers access to exclusive content and experiences not available anywhere else. To learn more, visit www.dcuniverse.com. DC, home to iconic brands DC (Superman, Batman, Green Lantern, Wonder Woman, the Flash), DC Vertigo (Sandman, Fables) and MAD, is the creative division charged with strategically integrating across Warner Bros. and WarnerMedia. DC works in concert with many key Warner Bros. divisions to unleash its stories and characters across all media, including but not limited to film, television, consumer products, home entertainment, and interactive games. Publishing thousands of comic books, graphic novels and magazines each year, DC is one of the largest English-language publishers of comics in the world. Warner Bros. Digital Networks (WBDN) creates, builds, and operates direct-to-consumer digital services, digital premium content, and experiences. The WBDN team is charged with bringing together a portfolio of brands and innovative, exclusive premium content, focused on serving digital-first audiences. Leveraging the studio’s iconic franchises and library, WBDN’s portfolio includes DC Universe, and Boomerang in partnership with Turner. WBDN also produces and distributes premium digital series through Stage 13 and Machinima and in partnership with LeBron James’ Uninterrupted and Ellen DeGeneres’ Ellen Digital Ventures. Warner Bros. Digital Networks’ premium programming and digital offerings put viewers at the center of entertainment, sports, gaming, and pop culture, reaching audiences anywhere, across any platform. Stay tuned for further updates right here at The World’s Finest. 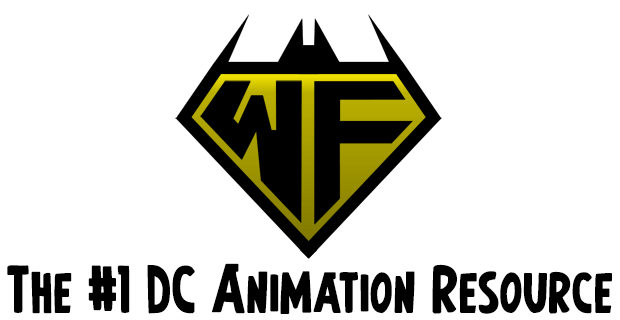 Discuss this news at The DC Animation Forum! 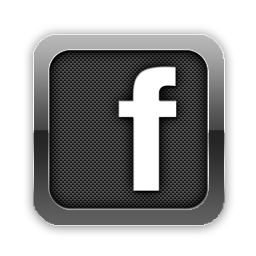 You can also share your thoughts on social media via The World’s Finest Twitter and Facebook pages! 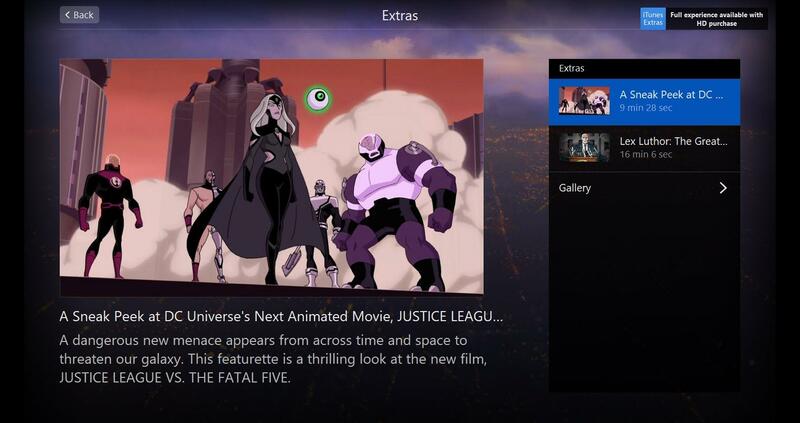 A preview image from the upcoming Justice League vs The Fatal Five animated movie is featured on the iTunes Extras page for the Reign of the Supermen animated feature. Justice League vs The Fatal Five, arriving early 2019, features the World’s Greatest Super-Heroes facing off against a threat from the future. No official details for Justice League vs The Fatal Five have been released as of yet, but expect that to change in January 2019. 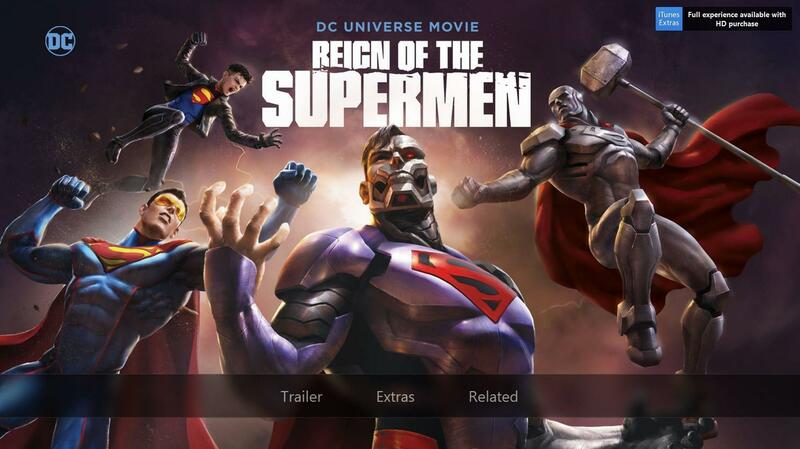 Reign of the Supermen will be available on Digital starting January 15, 2019, and Ultra HD Blu-ray Combo Pack and Blu-ray Combo Pack on January 29, 2019. Both digital and physical releases will include a preview of Justice League vs The Fatal Five. Until then, continue below for a first look at the upcoming DC Universe Movie title. Click on the images for a closer look. Please note the above images were taken by The World’s Finest and not released officially by Warner Bros. Home Entertainment. More details are forthcoming, so stay right here at The World’s Finest for more on both Reign of the Superman and Justice League vs The Fatal Five in the coming weeks. Reign of the Supermen will be available on Digital starting January 15, 2019, and Ultra HD Blu-ray Combo Pack and Blu-ray Combo Pack on January 29, 2019. Both digital and physical releases of Reign of the Supermen will feature a preview of Justice League vs The Fatal Five. 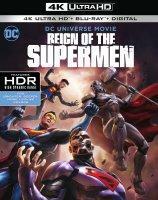 Click here for more details on the home media release of Reign of the Supermen. 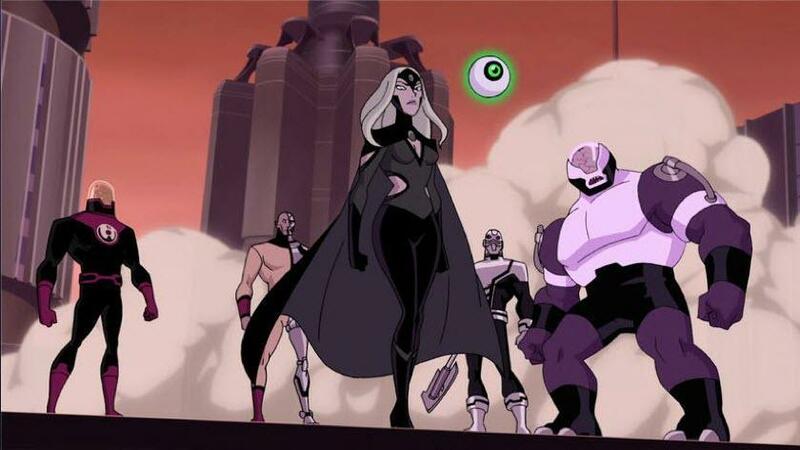 Justice League vs The Fatal Five is arriving early 2019 from Warner Bros. Home Entertainment. Warner Bros. Home Entertainment has issued press details promoting the regular edition release of the Batman: The Complete Animated Series Blu-ray set. The studio also provided a lengthy excerpt from the documentary included in the set, “The Heart of Batman.” The regular edition of Batman: The Complete Animated Series is a 12-disc set which features all 109 remastered Batman: The Animated Series episodes along with hours of bonus features, the heralded 90-minute “The Heart of Batman” documentary, the recently-remastered Batman: Mask of the Phantasm and Batman & Mr. Freeze: SubZero and a digital copy. Continue below for both the press details and a video clip for Batman: The Complete Animated Series Regular Edition Blu-ray. 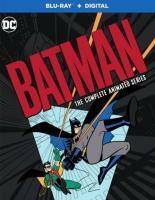 With copies of the popular Batman: The Complete Animated Series – Deluxe Limited Edition nearly sold out, Warner Bros. Home Entertainment and DC Entertainment have made available – effective Nov. 27, 2018 – the streamlined, content-only Batman: The Complete Animated Series Blu-ray/Digital box set ($89.99 SRP). The 12-disc set (plus a digital copy) features all 109 remastered episodes of the landmark television series along with hours of bonus features, the heralded 90-minute “The Heart of Batman” documentary, and the recently-remastered, fan favorite animated films Batman: Mask of the Phantasm and Batman & Mr. Freeze: SubZero. Amazon will continue to offer Batman: The Complete Animated Series – Deluxe Limited Edition Blu-ray box sets while supplies last. Produced by Warner Bros. 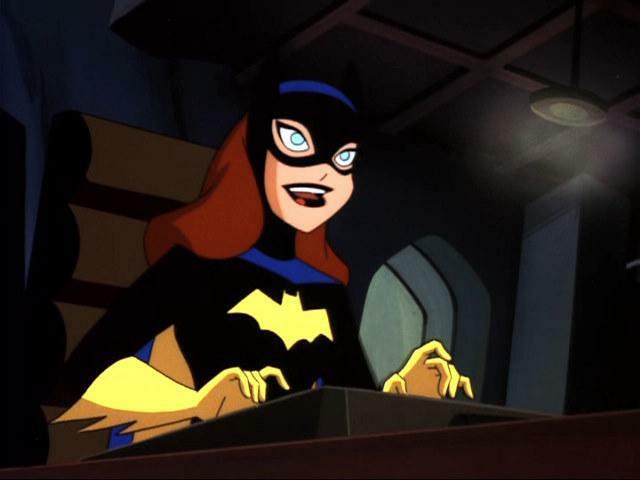 Animation, the Emmy Award-winning Batman: The Animated Series captured the imaginations of generations during its initial broadcast airing from 1992-1995, setting the standard for super hero storytelling for the past quarter-century with its innovative designs, near-perfect voice cast and landmark approach to DC’s iconic characters and stories. The series garnered a Primetime Emmy Award in 1993 for Outstanding Animated Program, along with three additional Emmy wins and 13 total Emmy nominations. Batman: The Complete Animated Series Blu-ray/Digital box set’s enhanced content includes 25 featurettes, two popular animated films; introductions to five episodes by producer Bruce Timm; and commentary on 12 episodes by various combinations of the production team: Bruce Timm, Eric Radomski, Paul Dini, Kevin Altieri, Michael Reaves, Boyd Kirkland, Shirley Walker, Glen Murakami, Dan Riba, and James Tucker. BATMAN and all related characters and elements are trademarks of and © DC Comics. © 2018 Warner Bros. Entertainment Inc.
Warner Bros. Animation (WBA) is one of the leading producers of animation in the entertainment industry, producing and developing projects for multiple platforms, both domestically and internationally. Theatrically, WBA’s full-length film, Teen Titans GO! to the Movies, released on July 27, 2018. WBA’s TV series include Teen Titans Go!, Unikitty! and the upcoming DC Super Hero Girls and ThunderCats Roar for Cartoon Network; Be Cool Scooby-Doo!, Bunnicula, Dorothy and the Wizard of Oz, The Tom and Jerry Show, New Looney Tunes, Wacky Races and the upcoming Scooby-Doo! and Guess Who? and Yabba Dabba Dinosaurs for Boomerang; Mike Tyson Mysteries for Adult Swim; Green Eggs and Ham for Netflix; Harley Quinn and Young Justice: Outsiders for DC Universe; Animaniacs for Hulu; and the upcoming Looney Tunes Cartoons content initiative. As home to the iconic animated characters from the DC, Hanna-Barbera, MGM and Looney Tunes libraries, WBA also produces highly successful animated films — including the DC Universe Animated Original Movies — for DVD, Blu-ray® and digital media. One of the most-honored animation studios in history, WBA has won six Academy Awards®, 35 Emmy® Awards, the George Foster Peabody Award, an Environmental Media Award, a Parents’ Choice Award, the HUMANITAS Prize, two Prism Awards and 20 Annie Awards (honoring excellence in animation). For a detailed review and breakdown of the Batman: The Complete Animated Series – Deluxe Limited Edition collection, check out our coverage here at The World’s Finest. The Batman: The Complete Animated Series Regular Edition Blu-ray collection is now available to own, and can be purchased through physical and digital retail outlets. For a closer look at the recent Batman: Mask of the Phantasm and Batman & Mr. Freeze: Sub-Zero high-definition remasters, click here and click here. Also, check out the Batman: The Animated Series subsite right here at The World’s Finest for a wealth of content, including extensive interviews, reviews, images, videos, special easter eggs, exclusive content and so much more. Discuss the Batman: The Complete Animated Series at The DC Animation Forum! The World’s Finest has published its review of the Justice League: Throne of Atlantis – Commemorative Edition, now available to own on Digital HD, 4K Ultra HD Blu-ray and Blu-ray. In short, while the video and audio upgrade is minor, the new bonus content is fairly entertaining and worth checking out, but that isn’t enough to make this release a must-own. However, for the diehard fans, it’s a worthwhile purchase. Plus, with the Aquaman live-action movie hitting theatres, it makes for solid complimentary viewing. To read the complete review, click on the image below. Justice League: Throne of Atlantis – Commemorative Edition is now available to own on Digital HD, 4K Ultra HD Blu-ray and Blu-ray. 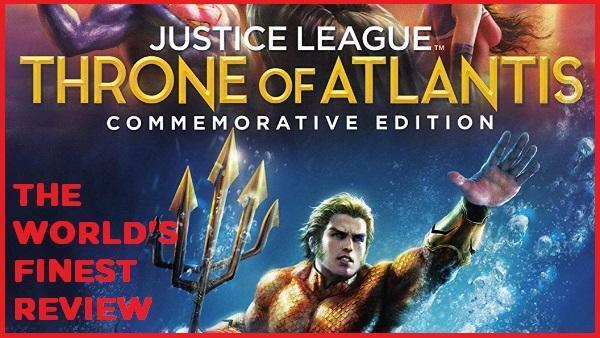 Check out the Justice League: Throne of Atlantis right here at The World’s Finest for more reviews, images, videos and exclusive content. 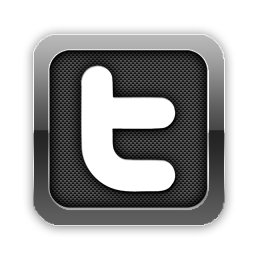 Plus, stay tuned for further updates right here at The World’s Finest and on Twitter. Discuss Justice League: Throne of Atlantis – Commemorative Edition at The DC Animation Forum! Fathom Events and Warner Bros. Home Entertainment have provided press details for an upcoming The Death of Superman/Reign of the Supermen theatrical screening event. Both DC Universe movie titles together faithfully adapt the landmark 1990s The Death of Superman comic event. The special double feature of the previously released The Death of Superman and the first in-theater screening of the all-new Reign of the Supermen nationwide is set for January 13 and 14, 2019. Continue below for the press details and the trailer for the special presentation. Superman’s greatest adventure – his death and rebirth – will be unveiled in a special two-day exclusive theatrical event as Warner Bros. and DC join forces with Fathom Events for a double feature presentation of the previously released The Death of Superman and the first in-theater screening of the all-new Reign of the Supermen nationwide on January 13 and 14, 2019. As the second half of the double feature, Reign of the Supermen will be seen nationally in theaters ahead of its Warner Bros. Home Entertainment release on Digital starting January 15, 2019, and on Ultra HD™ Blu-ray Combo Pack and Blu-ray™ Combo Pack on January 29, 2019. The Man of Steel meets his ultimate match when the monstrous, unstoppable creature Doomsday comes to Earth – hell bent on destroying everything and everyone in his path, including the Justice League – in the action-packed The Death of Superman. In the second half of this two-part landmark tale, Reign of the Supermen finds Earth’s citizens – and the Man of Steel’s heroic contemporaries – dealing with a world without Superman. But the aftermath of Superman’s death, and the subsequent disappearance of his body, leads to a new mystery – is Superman still alive? The question is further complicated when four new super-powered individuals – Steel, Cyborg Superman, Superboy and the Eradicator – emerge to claim themselves as the ultimate hero. In the end, will any of them prove to be the real Man of Steel? Tickets for The Death of Superman / Reign of the Supermen Double Feature can be purchased at www.FathomEvents.com and participating theater box offices. Fathom Events, Warner Bros. and DC present The Death of Superman / Reign of the Supermen Double Feature in more than 500 select movie theaters on Sunday, January 13 at 12:55 p.m. and Monday, January 14 at 8:00 p.m. (all local times), through Fathom’s Digital Broadcast Network (DBN). For a complete list of theater locations, visit the Fathom Events website (theaters and participants are subject to change). The two-part film is an animated adaptation of “The Death Of Superman,” DC’s landmark 1992-93 comic phenomenon, and features an all-star voice cast led by Jerry O’Connell (Carter, Bravo’s Play by Play, Stand By Me), Rebecca Romijn (X-Men, The Librarians) and Rainn Wilson (The Office, The Meg) as the voices of Superman, Lois Lane and Lex Luthor, respectively. The trio is joined by Jason O’Mara (The Man in the High Castle, Terra Nova) as Batman, Rosario Dawson (Sin City, Rent, Daredevil) as Wonder Woman, Shemar Moore (S.W.A.T., Criminal Minds) as Cyborg, Nathan Fillion (Castle, The Rookie) as Green Lantern/Hal Jordan, Matt Lanter (Timeless, 90210) as Aquaman, Christopher Gorham (Covert Affairs, Insatiable) as The Flash, and Nyambi Nyambi (Mike & Molly, The Good Fight) as Martian Manhunter, as well as Cress Williams (Black Lightning) as Steel, Cameron Monaghan (Gotham) as Superboy, Patrick Fabian (Better Call Saul) as Hank Henshaw & Cyborg Superman, Charles Halford (Constantine) as Bibbo Bibbowski and The Eradicator, and Tony Todd (Candyman) as Darkseid. SUPERMAN and all related characters and elements are trademarks of and © DC Comics. © 2018 Warner Bros. Entertainment Inc.
Stay tuned for additional updates on Reign of the Supermen right here at The World’s Finest. 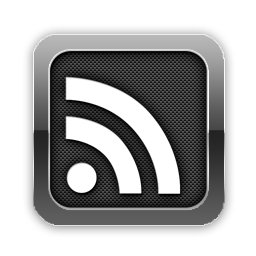 For coverage on The Death of Superman – including reviews, media and bonus content – check out The World’s Finest The Death of Superman subsite. Click here for more details on the home media release of Reign of the Supermen.